Compressor Ratio Explained For Beginners. It's not that hard! Does the compressor ratio knob confuse you? Well it did, and sometimes still does confuse me also. It’s one of those topics that I have to go back and re-visit the explanation especially if I’m trying to explain the exact mathematical results to someone. The simplest way I can explain what the compressor ratio knob does is tell the compressor how much compression to apply ONCE THE AUDIO PASSES OVER THE THRESHOLD YOU HAVE SET ON THE COMPRESSOR. It doesn’t matter what the ratio settings are 1.5:1, 3:1, 4:1, etc… etc… no compression will take place if the audio signal is not loud enough to cross that line in the sand you drew called the threshold. The Compression Ratio is set! Once the audio passes over the threshold then that is when the actual audio compression starts to happen. 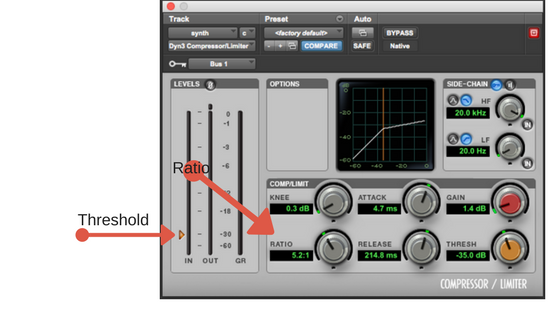 Based on what ratio you have set will determine how much or how little compression happens. To be honest, it’s hard as hell for me to remember all the equations and the math behind figuring out how much compression is taking place. If it’s confusing to you to, just remember lower ratios like 1.5:1, 2:1, 3:1 apply less compression and allow for more dynamics in the audio. Higher ratios like 5:1, 8:1, 10:1 apply more compression and less dynamics in the audio. I think of dynamics as energy. At the lower ratio settings on a vocal for example, allows for the vocal to breath a little and not be so squashed or lifeless. With a lower ration there is less gain reduction (turning things down) being applied and therefore the vocal sounds more natural. Below is a video example of using low and high compressor ratio settings on a vocal. If you really want to know the math behind the settings I’ll do my best here to explain it a little. So.. If you have the ratio set to 3:1 and the threshold is set to -10dbs, for every 3dbs your audio goes over the threshold it’s only going to allow 1db to actually pass. ( 3 to 1 ratio). If the audio goes over your threshold by 6dbs at a 3:1 ratio, then it would only let 2dbs of output gain pass. It is reduced by a factor of 3. Make sense? Maybe not. I know it’s damn confusing. Anyways, I did my best to explain that. Just remember it’s all about the feel and not the math. Use your ears to determine if you like what the lower or higher ratio settings are doing to you audio. Grab you FREE Ebook and EQ chart below or on the side bar if you’re on a desktop. Please share this post with anyone you think would find it useful. Leave a comment below if you like. 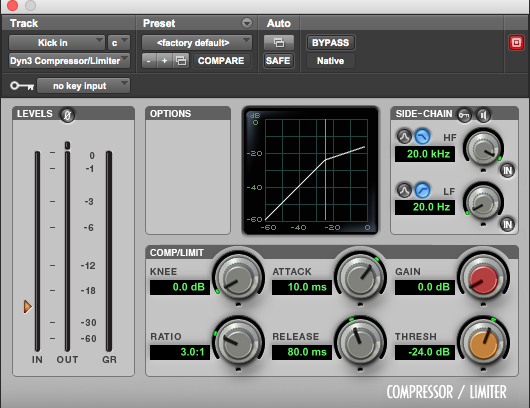 Check out this post on Audio Compression which breaks down all the knobs on a compressor.